being Japanese Canadian and to accept my Japanese heritage. Mixed media on canvas(Chiyogami paper, Obonai Feather paper, Acrylic paint, photo images, sumi ink) 2012 24" x 22"
Mixed media on canvas (Photo images, Japanese Unryu Tissue, Arashi Mixed, Sumi ink, acrylic paint) 2012 24" x 22"
Mixed media on canvas (Photo images, Pencil, Sumi ink, acrylic paint) 2012 24" x 22"
Mixed media on canvas(Chiyogami paper,Japanese Unryu Tissue , Acrylic paint, photo images, sumi ink, pencil) 2012 24" x 22"
My grandfather, Nitaro Hamaguchi, had been a fisherman all his life, emigrating to Canada in 1900 and becoming a Canadian citizen in 1907. Days after Japan bombed Pearl Harbour, his fishing boat was impounded by order of the Government of Canada, under the protection of The War Measures Act. He had just returned from a long fishing trip up the coast of British Columbia, and had painted his boat and overhauled the engine for the winter. 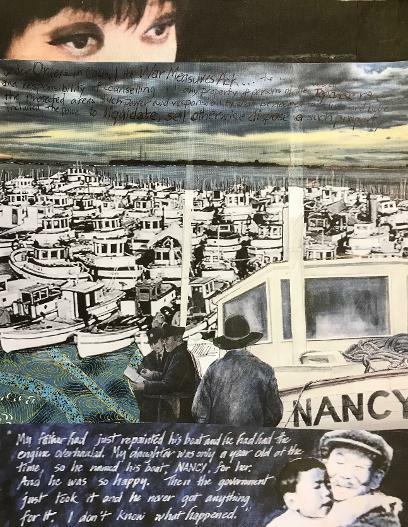 He had renamed his boat "NANCY", after his one-year-old granddaughter, Nancy. He assumed that the impoundment was only temporary and that he would eventually get his boat back. But the boats were auctioned off, and of the thousands of Japanese-Canadian fishermen who made financial claims, only ninety-five were awarded a paltry $207.84. Ji-chan was one of the majority who received nothing. In this piece, I am looking back in time at my mother, who is standing in a beet field. Strangely, perhaps, she is smiling, in spite of the awful living conditions she had to endure. In fact, my mother was usually a happy person who looked on the bright side of things. Perhaps, also, the smiling was a reflection of the Japanese aspect of her character --- the acceptance with stoicism of whatever life brought. A common saying was, Shigata ga nai - It can’t be helped. The juxtaposition of the smile and the horror of what Canada had done to her is shockingly ironic. Stripped of her identity as a citizen, she had to carry an identification card with her fingerprints. She was reduced to being the equal of the German prisoners of war who laboured in the same fields, guarded by soldiers with rifles. She was not allowed to travel outside Alberta until 1951, five years after the war was over. More humiliating still, she did not have the right to vote in Canadian elections until 1952. Though born in Canada, she was no longer a Canadian citizen. 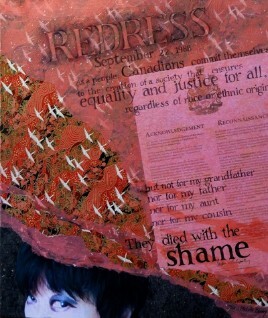 Indeed, she, along with her fellow Japanese-Canadians, was reduced to the status of stateless people. I am challenging the viewer to look at the experience through my eyes. My family were forced to leave their home in B.C. and sent to toil in sugar beet fields in Alberta, where I was born. Here, I look at myself as a child, standing behind a barbed wire fence, hiding ironically behind my “anglo” doll. 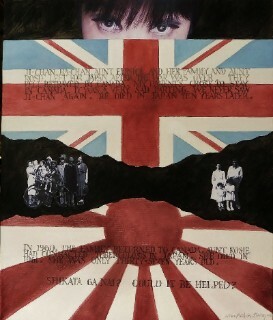 Even children of Canadian-born parents of Japanese heritage were considered “enemy aliens”. Behind me is the order issued by the Canadian government to move us inland, away from the coast. The irony is that now, sushi, along with Japanese cars, is enormously popular. There are sushi restaurants on every corner, offering to the Canadian public, all the sushi they can eat. And the appetite for sushi is growing by leaps and bounds. I had never thought that I would see this dichotomy in my lifetime. After living in wretched, exhausting, conditions for four years on sugar beet farms near Lethbridge, Alberta, my grandparents decided that the family should return to Japan after the war was over. They were bitter and heartbroken, and felt that Canada had turned its back on them. The government had promised that their removal would be temporary, but it became obvious that their relocation to Alberta was permanent when they were still in Alberta a year after the war had ended. In 1946, my grandparents, who had become Canadian citizens, my aunts and my cousins who were Canadian-born, left for Japan. My parents, who were Canadian-born as well, refused to leave with them. My grandparents left in anger and my parents did not hear from the family until my grandfather died in 1956. It was a very sad parting. In effect, the war had split my family apart. In 1960, my family in Japan returned to Canada because Aunt Rosie had contracted Tuberculosis in Japan and she could not receive treatment there. It was too late for her and she died in Vancouver in 1961. She was only thirty-seven years old. On September 22, 1988, the Government of Canada announced a Redress settlement to Japanese Canadian survivors of the forced Evacuation from B.C. in 1941, for they injustice they had endured. 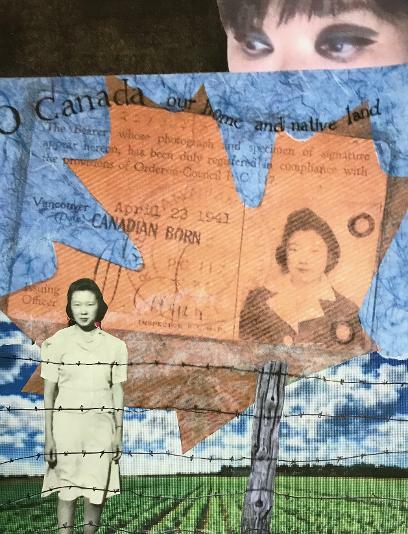 The government acknowledged that the forced removal was unjust and also recognized that despite the great hardships, all Japanese-Canadians had remained loyal to Canada. The Canadian government officially apologized for its treatment of us. It is very sad that my father, my grandparents, my aunt and my cousin died before they knew that their country finally admitted that it had been wrong. I hope that the government of Canada will never treat any of its citizens in this way again. 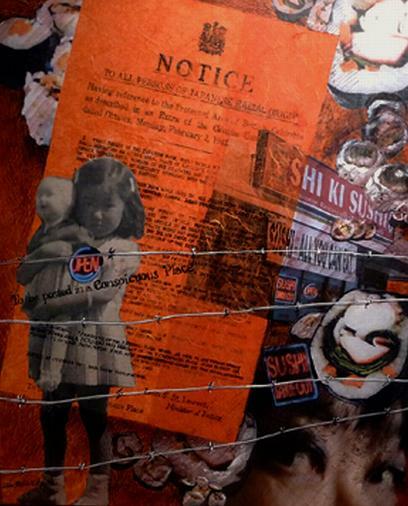 “Despite perceived military necessities at that time, the forced removal and internment of Japanese Canadians during World War II and their deportation and expulsion following the war, was unjust. In retrospect, government policies of disenfranchisement, detention, confiscation and sale of private and community property, expulsion, deportation and restriction of movement, which continued after the war, were influenced by discriminatory attitudes. Japanese Canadians who were interned had their property liquidated and the proceeds of the sale were used to pay for their own internment."